The porous media, or soil, can be either a two-phase or three-phase composition. When you have dry soil, only the solid soil particles and air within the pores are present, resulting in a two-phase media. Obviously, when liquid (i.e. water) is added to the media, it is then a three-phase composition. Many of these parameters are used in hydrogeological studies every day, such as porosity and moisture content. Depending on the make up of the subsurface, such as the stratigraphy and lithology, you may encounter several different values for the above parameters with depth. Differentiating between these units can often be difficult, however, equipment is available for partitioning off sections for sampling, such as the Solinst Discrete Interval Sampler. Craig, R.F. (1997). Soil Mechanics; Sixth Edition. Published by Chapman & Hall, USA. Fetter, C.W. (1994). Applied Hydrogeology; Third Edition. Published by Prentice-Hall, Inc. , Englewood Cliffs, NJ. Schwartz, F.W. and Zhang, H. (2003). Fundamentals of Groundwater. Published by John Wiley & Sons, Inc. New York, NY. The Solinst Discrete Interval Sampler is a stainless steel sampler, with LDPE tubing mounted on the convenient Solinst reel. 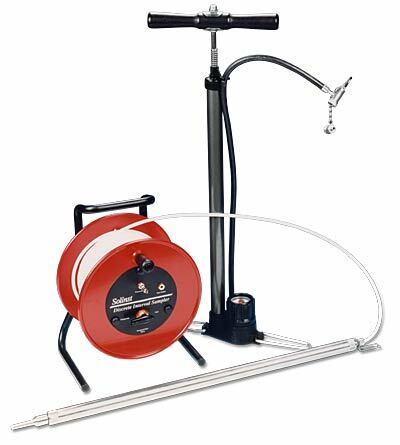 The reel has a pressure attachment for the high pressure hand pump, and a pressure/vent switch which is used to apply and release the pressure on the sampler. A sample release device is included with each Discrete Interval Sampler.